10 May 2018, Horw, Switzerland: Toradex announced that it has opened early access for selected customers to its new Apalis iMX8 System on Module (SoM) based on the NXP® i.MX 8QuadMax SoC. The Apalis iMX8 is the latest member of the Apalis family, a high-performance Arm®-based pin-compatible SoM. 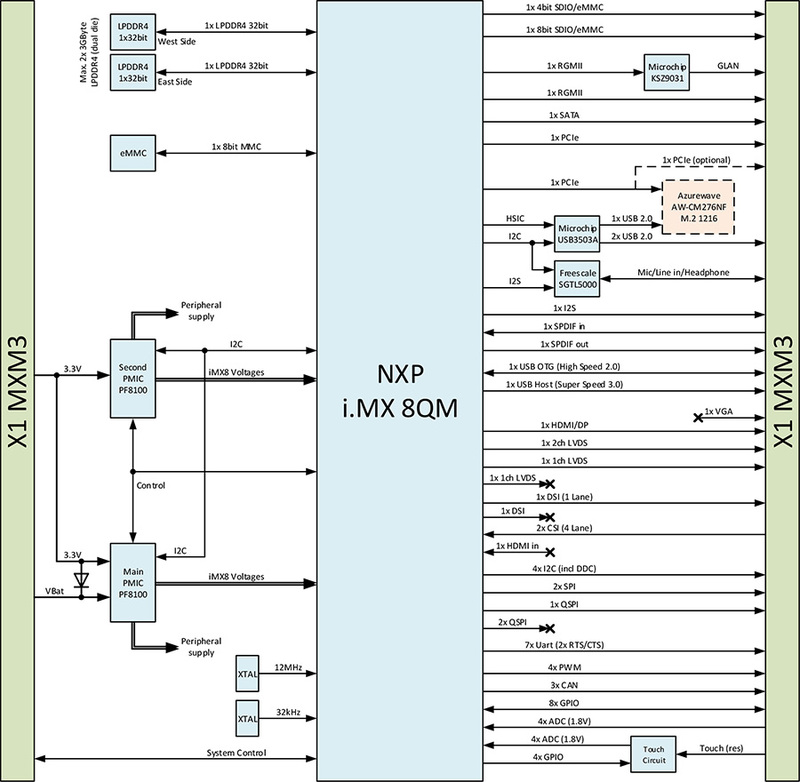 The NXP i.MX 8QM SoC is the highest performance variation of the i.MX 8 family, featuring 6x Armv8-A 64-bit processor cores – 2x Arm Cortex-A72 & 4x Cortex-A53 – as well as 2x additional Cortex-M4F microcontrollers. The integrated HIFI4 DSP, a high-performance dual GPU, 28 nm FD-SOI technology, and extra safety features are other differentiators to the lower performance i.MX 8M SoC. 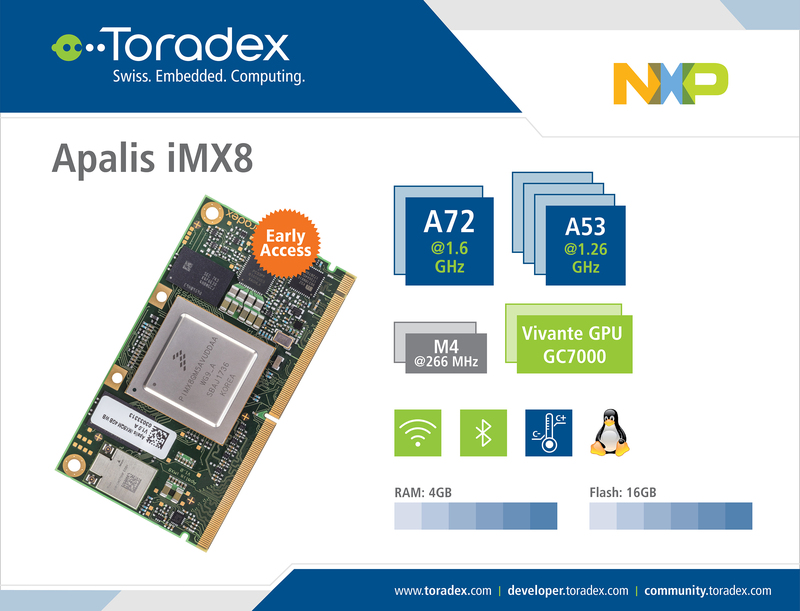 The release version of the Apalis iMX8 will come with all the standard Toradex advantages including Toradex Easy Installer, Free Professional Support, Production-quality Yocto Project Based Linux BSP, Active Community, Daily updated Developer Page, Pin-out Designer tools, Fully open Carrier Board Designs, World Wide Network with local support offices and much more. Toradex Partners are already working for solutions on top of Toradex SoM offerings; this includes Graphical User Experience, Deep Learning Inference Optimization, Machine Vision Tools, and additional Operating Systems. Apart from its high performance and rich interfaces, the i.MX 8QuadMax stands out with long availability of over 10 years. The SoC is built with 28 nm FD-SOI technology to reduce soft errors and increase MTBF. High shock and vibration resilience and a temperature range from -40° to 85°C, makes the Apalis iMX8 a great choice for edge computing applications in the most demanding environments. The samples available for the early access feature 4GB RAM and up to 16GB Flash Memory. Toradex has also opened the forum to the public to provide input for the final module configurations.